NES Donkey Kong (JPN/USA) in 01:08.67 by Phil. 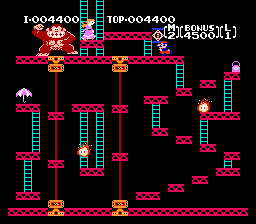 Donkey Kong is a classic game that has been challenged plenty of times at this site, by many players. This competitive spirit has made for some "perfect" runs. Yet each time someone manages to squeeze just a bit more out of it. This latest completion by Phil beats the previous movie by 11 frames by carefully optimizing Jumpman's movement pattern.